President Obama has been getting a lot heat since the announcement that the 2016 Olympics would not be coming to the United States. The right has rejoiced in our loss, and Fox News and other right wing media have gone berserk with stories about the Chicago Olympic Committee, and false claims of cronyism and corruption. 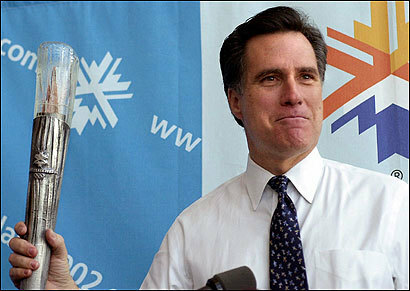 Romney communicated his intention to take full command of the Olympics on his first day on the job in February of 1999. A century and a half after his ancestors trudged through Emigration Canyon to help pioneer the valley as a land of the righteous, Romney arrived in a cheerless ballroom in a Salt Lake City hotel. Immediately, he raised a rhetorical scythe at the trustees of the scandal-tainted organizing committee. Much of the damage seemed to stem from decisions made by two previous executives on the Salt Lake City organizing committee, chief executive Thomas K. Welch and vice president David R. Johnson, who embraced the tacit form of influence peddling that greased the international selection process for Olympic sites. Vowing not to be defeated again, Welch and Johnson funneled through the committee more than $1 million in gifts to numerous IOC delegates for the 2002 Games - a stunning trove of booty that included cash, college tuition, medical-care payments, jobs, lodging, beds and bedding, bathroom fixtures, Indian rugs, draperies, doorknobs, dogs, leather boots and belts, perfume, Nintendo games, Lego toys, shotguns, a violin, and trips to ski resorts, Las Vegas, and a Super Bowl in Miami. Almost no request from an IOC member went unmet. Shamed by the scandal - in which 10 members of the International Olympic Committee would resign or be expelled for accepting gifts from the Salt Lake committee - Utah's power brokers believed they needed a new CEO wise in the ways of business, the law, and Mormonism. Almost as soon as Romney took the job, however, the Mormon Church's role in the Games became a source of contention - a dispute exacerbated by Romney's request for an additional $8 million in loaned property and cash from the church, among other contributions. Utah's wealthiest businessman, Jon Huntsman Sr., the father of Utah's current governor, assailed Romney for exploiting his ties to the church. Huntsman himself is prominent in the Mormon Church, which is officially known as the Church of Jesus Christ of Latter-day Saints. Romney came in after the initial bribery scandal, but created plenty of controversy of his own. Romney later successfully lobbied the IOC to drop its opposition to the US team carrying into the opening ceremonies a tattered American flag found in the rubble of the World Trade Center. But he angered safety officials when his office denied free or discounted tickets to widows and orphans of firefighters who died at the World Trade Center. Romney's executive assistant, Donna Tillery, twice rejected the requests, citing a policy barring ticket giveaways, according to e-mails she sent to former Salt Lake City firefighter A.J. Barto. Romney's staff says he was unaware of the request. Six weeks later, the committee found itself with unsold seats and Romney approved distributing 100 tickets valued at $885 each to Utah legislators.